The renowned chassid Rabbi Moshe Meisels of Vilna, youngest of Rabbi Schneur Zalman's disciples, once told Rabbi Eisel of Homel: "The aleph of Chassidism saved me from a certain death." Rabbi Moshe Meisels, an extremely learned man, was fluent in German, Russian, Polish and French. 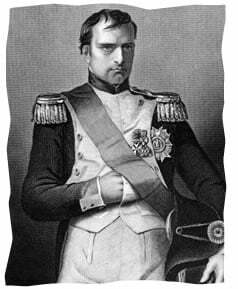 During Napoleon's war on Russia he served as a translator for the French High Command. Rabbi Schneur Zalman had charged him to associate with the French military officials, to attain a position in their service, and to convey all that he learned to the commanders of the Russian army.1 Within a short while Rabbi Moshe had succeeded in gaining the favor of the chief commanders of Napoleon's army and was privy to their most secret plans. It was he, Reb Moshe, who saved the Russian arms arsenal in Vilna from the fate which befell the arsenal in Schvintzian. He alerted the Russian commander in charge, and those who tried to blow up the arsenal were caught in the act. "The High Command of the French army was meeting," related Reb Moshe "and hotly debating the maneuvers and the arrangement of the flanks for the upcoming battle. The maps were spread on the floor, and the generals were examining the roads and trails, unable to reach a decision. Time was short. Tomorrow, or, at the very latest, the day after, the battle on the environs of Vilna must begin.
" 'And who is this stranger?!' he continued, pointing to me. In a flash he was at my side. 'You are a spy for Russia!' he thundered, and placed his hand upon my chest to feel the pounding heart of a man exposed. At that moment, the aleph of Chassidism stood me by. My mind commanded my heart to beat not an increment faster. In an unwavering voice I said: 'The commanders of His Highness the Emperor have taken me as their interpreter, as I am knowledgeable in the languages crucial to the carrying out of their duties...' "
Rabbi Schneur Zalman of Liadi, also known as the "Alter Rebbe" and "The Rav," was born in Li'ozna, White Russia, on the 18th of Elul 5505 (1745). He became a disciple of Rabbi DovBer of Mezeritch (the second leader of the Chassidic movement) in 1764. In 1772 he established the "Chabad" branch of the Chassidism. For twenty years he worked on his Tanya, in which he outlined the Chabad philosophy and ethos. First published in 1797, the Tanya is regarded as the "bible" of Chabad Chassidism upon which hundreds of works and thousands of discourses by seven Generations of Chabad rebbes and their disciples are based. Rabbi Schneur Zalman passed away on the 24th of Tevet, 5583 (December 1812) while fleeing Napoleon's armies. Rabbi Moshe Meisels was originally a disciple of Rabbi Eliyahu, the Gaon of Vilna, and a member of the opposition to the Chassidic movement. He later became a devoted chassid of Rabbi Schneur Zalman of Liadi, and, after the latter's passing, of Rabbi DovBer of Lubavitch and of Rabbi Menachem Mendel of Lubavitch. Rabbi Moshe served as the leader of the Chassidic community in Vilna until 1816 when he made aliyah ("ascent") to the Holy Land and settled in Hebron, where he passed away in 1849. Rabbi Schneur Zalman actively supported the Czar against Napoleon during the Napoleonic Wars, both on the celestial level, intervening on high for a Russian victory, and by down to earth methods such as the Chassidic spy of our story. Rabbi Schneur Zalman was of the opinion that while Napoleon's plans of "emancipating" the Jewish community may bring respite from the harsh Czarist decrees and improved material conditions, this is but the glittering veneer of forced assimilation and spiritual genocide. The Rebbe's contribution to Russia's victory was recognized by the Czar, who awarded Rabbi Schneur Zalman descendents the status of "An Honorable Citizen For All Generations." Five generations of Chabad Rebbes were to make use of this special standing in their work on behalf of the Jews of Russia. Told by the sixth Lubavitcher rebbe, Rabbi Yosef Yitzchak Schneersohn; translation/adaptation by Yanki Tauber. To the crux of your issue about what was better for the Jews, Napoleon, or the Czar - please see the article linked below in Rabbi Posner's response, I think you will find it illuminating. As far as betraying the French, the Chassid was not a French citizen and did not owe the French his allegiance - the French were actually an invading army. Some might refer to Rabbi Moshe Meisels as a freedom fighter! One final point about the Gaon and his attitude towards the Chassidic movement, it is even more ironic that Rabbi Moshe Meisels, who was his student - as stated in the article, ultimately chose to become a Chassid. Yes, you are right in that the French were an invading army. And, yes, Napoleon, who visited the great synagogue of Vilna where my ancestors surely worshipped , certainly wanted Jews to assimilate-like other groups- but also wanted them to preserve their religion. While it is significant that Rabbi Meisels was a student of the Gaon, I cannot see how he was a "freedom fighter." For whom? In this situation the Jews of Vilna had no winning hand, as the Russians won anyway and what followed was a century of programs and persecution . Also, because the Jewish people of Vilna did not side with the Lithuanians who sided with the French, I think it contributed to the unfolding anti-Semitism of the Lithuanian people, finally revealing itself in their easy collaboration with the Nazis during the Holocaust. RE: emancipation vs. pogroms If you take a look at Jewish History at the time, many Rabbis opposed Napoleon, Napoleon had a strong desire for Jews to assimilate. The Chasam Sofer also strongly opposed Napoleon, obviously it wasn't a matter of ego. Connection Rabbi Moshe Meisels must have watched Kabbalah toons. Does your Heart Grow Only in Poverty? If only in poverty can man’s heart be close to G-d, how would they still be here today to worship G-d? Would they survive poverty and disease? No, I believe they would endure a slow demise and be extinct. Their imminent future was doomed. Maybe their heart belongs to G-d but is that what G-d would like for them in order to survive in this world? Napoleon’s view for the Jews’ emancipation gave them the freedom to worship their G-d too. It was man’s choice to continue to do so, and many today have done just that, which resulted in the extermination of 6 millions Jews whose hearts had not left G-d.
What is the Connection? How is this related to Napoleon and the Jews? If any connections, please let me know because I don’t see it. Maybe the two wings are a metaphor for the 2 camps, one Russian and one French, and in order to survive the Rabbi had to flap between both camps playing both of them! emancipation vs. pogroms I understand he was a spy. So he was betraying the French. Were the Jewish better off with the Russians in those times? How did the Russians treat the Jewish in those times? At least Napoleon tried to assimilate and emancipate the Jewish versus killing them. He gave them more chances than the Russians did later on or even maybe during that period of time. I believe it was a matter or alter ego rather than good reasoning. RE: Russian Arms! Reb Moshe actually served as a Russian spy. He worked for the French and conveyed much useful information to the Russians. Russian Arms! It was he, Reb Moshe, who saved the Russian arms arsenal in Vilna from the fate which befell the arsenal in Schvintzian. He alerted the Russian commander in charge, and those who tried to blow up the arsenal were caught in the act. Why did Reb Moshe save the Russian arms, if he was helping the French army? not too clear.